Is there a better alternative to Dot1xProfile? Is Dot1xProfile really the best app in Network category? Will Dot1xProfile work good on macOS 10.13.4? Dot1xProfile is a small utility to generate 802.1x network authentication profiles. It can quickly create 802.1x profiles without using MDM (Mobile Device Management) tools such as Apple Configurator or OS X Server. 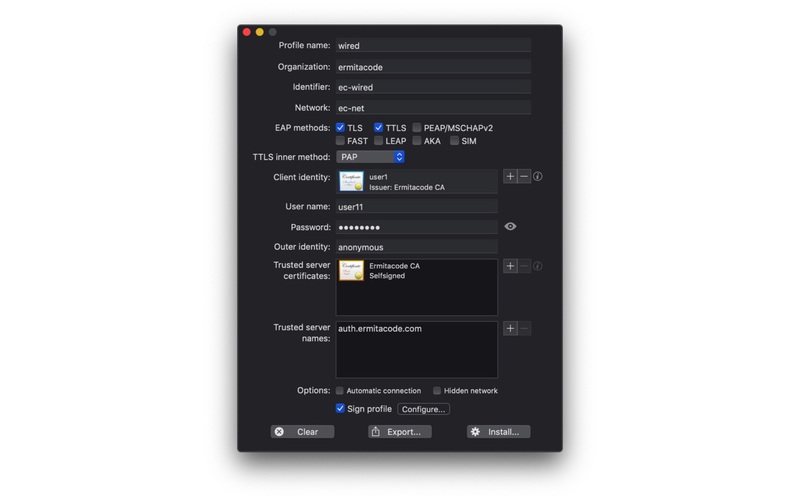 Dot1xProfile does not replace these tools, but can be helpful in test environments and when you need to quickly set up access to a network with 802.1x authentication. It supports major EAP (Extensible Authentication Protocol) methods used in wired and wireless networks (TLS, TTLS, and PEAP). Dot1xProfile needs a review. Be the first to review this app and get the discussion started! Dot1xProfile needs a rating. Be the first to rate this app and get the discussion started!